Indira Gandhi would have been happy had she known that environment, in which she took an active interest, has now become a central concern of governments the world over. Her deep understanding and involvement in environmental concerns was reflected in her ideas and policies, which provided guidelines not only for India, but all other Third World and similarly placed countries. 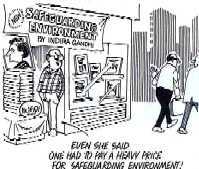 Safeguarding Environment has been collated by the Indira Gandhi Memorial Trust from the late Prime Minister's major speeches on environment and attendant concerns, delivered at national and international fora. The book serves the useful purpose of a primer on environment. As an able statesman, Mrs Gandhi realised ecological problems were created by the need of the poor for a livelihood, the greed of middlemen for quick profits, the demands of industry, and the shortsightedness of the administration. It was at her instance that land and water use boards were set up in the states. Unfortunately, these boards have failed to live up to expectations. The importance of people's participation was acknowledged by her much before the world homed in on it as a buzzword. She realised that environment, by its very definition, was pervasive, and, therefore, there can be no environmental planning without the involvement of people at all levels. Though Safeguarding environment is rather attractively presented, it is too expensive. At Rs 160, it may put off a lot of potential buyers.